Willie Taggart's first year in Tallahassee hasn't gone as planned, as his Florida State Seminoles have started 4-4. While there were some ugly early moments, the season hit a low point Saturday as the No. 2 Clemson Tigers blew out the Seminoles, 59-10, in Tallahassee, Florida. According to ESPN.com's Andrea Adelson, the 49-point loss matched the worst defeat in program history. "Embarrassing performance. First time since I've been here where I felt like we had some guys that quit on our football team, and that can't be tolerated. There's one thing you can't do, you can't quit. If you quit, you don't play, so we got to do a great job of evaluating that film and making sure we got the right guys that's out there battling with us." Florida State stayed with Clemson for a quarter, but the Tigers dominated afterward. They put up 28 and 24 points in the second and third quarters, respectively, on their way to a 52-3 lead. If not for a late touchdown by the Seminoles, the final score could have been worse. Clemson more than doubled Florida State's total yards, 524-247, as the defense forced the Seminoles into negative-21 rushing yards. And while it's one thing to lose to a better team, the Seminoles were undisciplined, incurring 16 penalties for 134 yards. 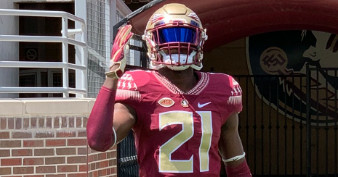 Florida State sophomore Hamsah Nasirildeen was also ejected for targeting in the second quarter after a hit on Clemson quarterback Trevor Lawrence. All of that contributed to Florida State's worst-ever home loss. Virginia Tech and Syracuse blew out FSU earlier this season, while archrival Miami beat it by one. The Seminoles' wins have come against Samford (a game they trailed with less than five minutes to play), Northern Illinois, Louisville and Wake Forest, with the latter two a combined 1-8 in ACC play. For a program that won the national championship five seasons ago, it has been quite a fall. Taggart will look to restore order as his Seminoles seek bowl eligibility. Three of their final four games are against ranked opponents: No. 22 NC State, No. 3 Notre Dame and No. 9 Florida. If the coach can't get his team focused, it could be a rough finishing stretch.